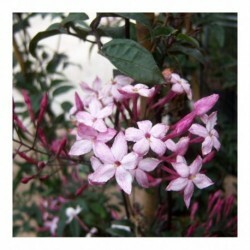 This is a vigorous evergreen climber with purple divided leaves. From late winter-spring it bears panicles of rosy pink fragrant flowers which emerge from dark pink buds. It needs a warm sheltered position or can be grown as a houseplant or conservatory plant in colder areas. Best in sun or light shade.